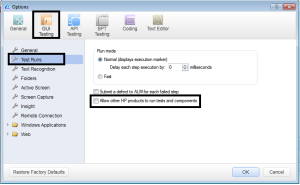 Integrating with ALM – Before connecting to ALM, we need to check an option which allows other HP products. You will find this option at the below path. 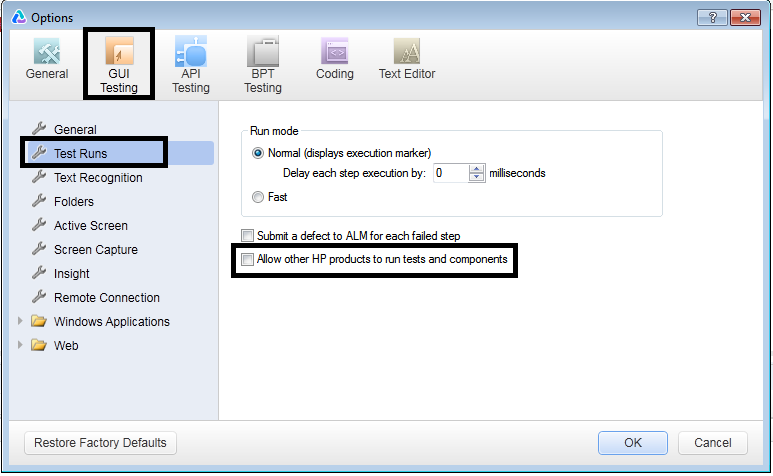 Right side you will see an check box ‘Allow other HP products to run tests and components’. If this is not checked,then check it. Then, you need to make a connection. For that, Go to menu ‘ALM –> ALM connection’ or the same icon will be displayed at the tool bar as well. After clicking on the icon, It will open a new window where you need to enter the server details,credentials and project details to connect. Click on Connect button. If connection is successful,then login button will be enabled. Select your project details and click on login. If you select check box ‘Restore connection on startup’. It will restore the connection when you reopen UFT. After connection established, If you open any file ,it will show the 2 options. One is to select from the local system and another from ALM. Now, you can select ALM and the desired path in ALM. We can control the version history from UFT. In UFT,We have an option to check in and check out script stored in ALM. This option can be accessed in ALM menu of UFT.